While you are in Edinburgh, on Princes Street, I know you will enjoy the National Gallery of Scotland. The collection is free to the public, open daily, and amongst the best in the world. 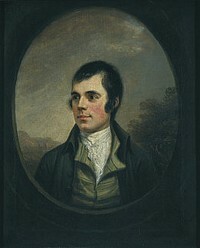 Scotland's National Gallery holds so many works of art, and probably the most famous of all paintings of Robert Burns (Scotland's National Bard) by Alexander Naysmith.. The gallery also has paintings by Poussin, Claude Lorraine, Rembrandt, Reynolds, Gainsborough, Chardin, Antonio Canova and Turner, as well as French Impressionists, and Scottish artists. Commissioned in 1892 by Andrew Noel Agnew, a barrister and baronet of Lochnaw, this painting of his young wife, Gertrude, was exhibited at the Royal Academy in 1898. 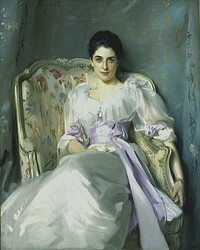 The painting by John Singer Sargent launched Sargent's career as an artist and Lady Agnew's as a society beauty. 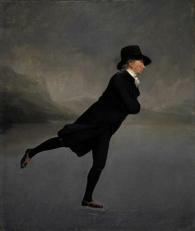 This skater is thought to be the Reverend Robert Walker, minister of the Canongate Kirk (Church) and a member of the Edinburgh Skating Society. The club - the oldest of its kind in Britain - usually met on the frozen lochs of Duddingston or Lochend on the outskirts of Edinburgh. This is one of Gainsborough's finest full-length portraits. Her dress and accessories are the height of seventeenth-century fashion. She was born the Honourable Mary Cathcart, daughter of the 9th Baron Cathcart. Her father was Ambassador to Catherine the Great. She married in 1774 to Thomas Graham, (later Lord Lynedoch), a Perthshire landowner. 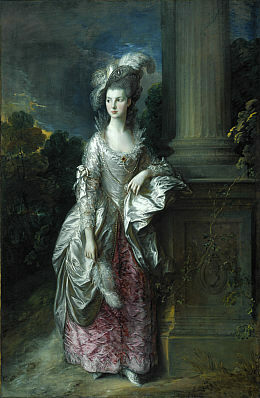 The portrait was highly acclaimed when exhibited at the Royal Academy in 1777. Thomas Graham was devastated by his wife's premature death in 1792. He passed the painting to her sister who bequeathed it to the National Gallery on condition that it never leaves Scotland. 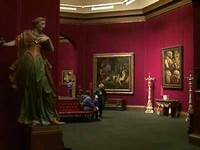 This is the inside of one of the rooms in the National Gallery..